The FMUL community got together once again to celebrate Research Day (7th edition), organised by the GAPIC and the AEFML under the “Join the Party” motto, and aimed at connecting, mobilising and energising more than 500 students who have developed more than 400 research projects throughout the 21 editions of the “Education for Science” Program, as well as the mentors who accompanied them and the teams from the centres. At the Opening Session, in addition to Professor Ana Espada de Sousa coordinator of the GAPIC, Professor Mamede de Carvalho, Deputy Director of the FMUL, Professor J. Eurico da Fonseca, Vice-President of the Scientific Board were also present. 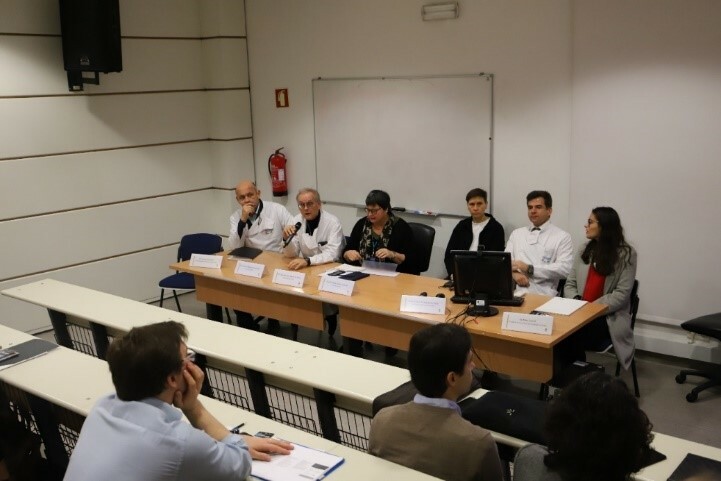 The iMM was represented by Professor Maria do Carmo Fonseca, the HSM-CHULN by Professor Lucindo Ormonde, and the AEFML was represented by its President, the student Andreia Daniel. All emphasised the importance of programs aimed at supporting the research developed at the GAPIC, as well as Research Day, in the promotion of scientific research among students, fostering the scientific culture of future physicians. Given the importance of the programs aimed at supporting the research of the GAPIC, at the Opening Session Professor Ricardo Fernandes of the GAPIC team, presented the PREPIT (Pregraduate Research Program – Impact and Trajectories project, which aims at evaluating the scientific, academic and professional outcomes of the GAPIC Alumni who participated in the GAPIC. pre-graduate programs. This project relies on the collaboration of the Library and Information Area and is expected to be launched later this year. Aiming at making the GAPIC Alumni network more dynamic, we highlight the Research Paths session, in which three alumni presented their academic and professional paths that, although different, are all connected to scientific research, Inês Vaz Luís (Unité INSERM 981 – Breast cancer survivorship research unit, of the Institut Gustave Roussy of Paris); ); Tiago R. Matos (Department of Dermatology, of the Amsterdam University Medical Centres The Netherlands); Bruno Miranda (Department of Neurology of the CHULN and of the Institute of Physiology of the FMUL). In addition to having presented their individual work, all mentioned the importance of their experience as GAPIC Alumni in their research career (see article GAPIC Alumni, a Growing Network). This day was mainly dedicated to the presentation of 31research projects developed by 43 students within the scope of the 21st Edition of the “Education for Science”/CHULN/FMUL Scholarships (2017/2018). 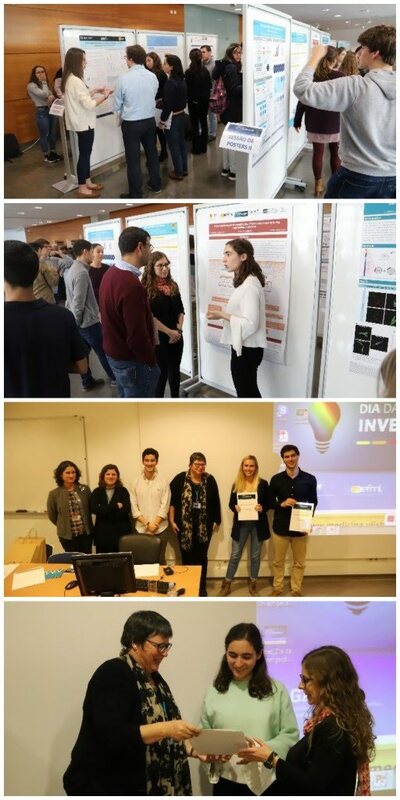 1st Prize – David Paixão e Sara Rosa, “Role of the AhR interacting protein (AIP) in T cells”, mentored by Birte Blankenhaus & Cristina da Conceição Varandas Ferreira, who developed their research at the M. Veldhoen-Lab. 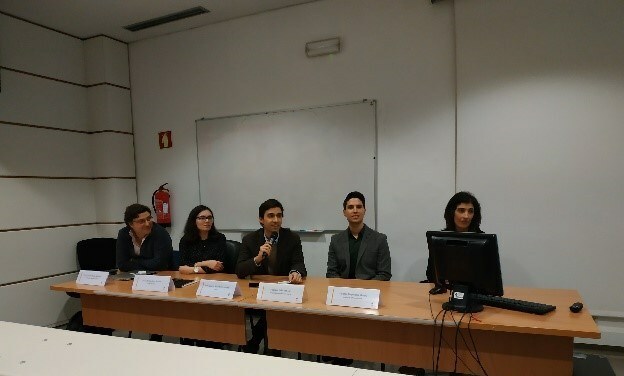 2nd Prize – Angélica Ferreira and Mickael Bartikian, “Applicability of 3D Printing in Neurosurgery”, mentored by Lia Pereira Lucas Neto and Alexandre Rainha Silva Campos, who carried out their research at the Institute of Anatomy. 3rd Prize – Ana Filipa Pereira and Ana Paula Lopes, “Evaluating the impact of extending the inflammatory response during regeneration in zebrafish”, mentored by Maria Leonor Tavares Saúde, who developed their research at the Leonor Saúde Lab. 2nd Honourable Mention – Ana de Lurde Logrado, “Zebrafish Xenographers as a model for chemo evaluation and radiosensitivity of BRCA2 mutation tumours”. “Pathophysiology of Cerebral Venous Enfusion“, a project developed by Diana Dias de Sousa within the scope of the 11th Astra Zeneca Foundation/FMUL Research Grant, was also presented on this day. 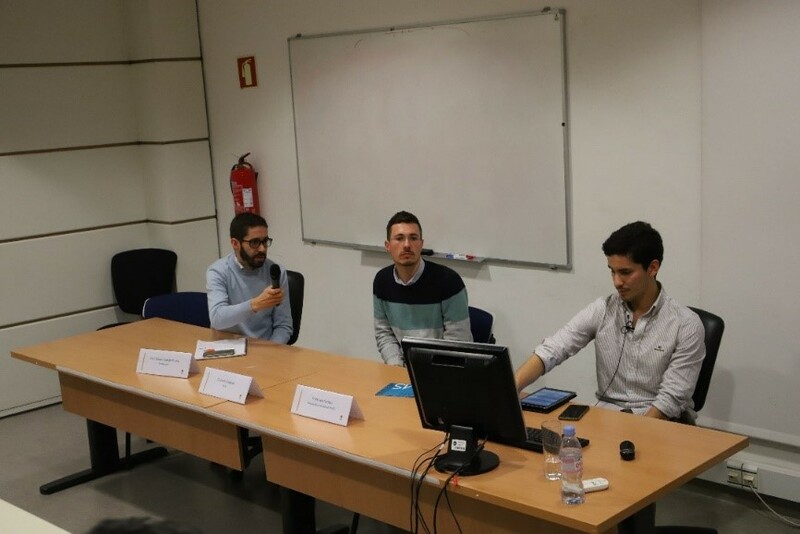 As usual, the AEFML organised a session to which it invited, in addition to the students who organised the AIMS Meeting Research Competition, GAPIC student Cristiano Esteves, and mentor Simão Rocha, who talked about their different experiences in the framework of a GAPIC. project. At the end of this session, the winners of the “Quizz”,” organised by the AEFML with the aim of encouraging student participation on Research Day were also revealed. During the day, the nearly 150 participants also had the opportunity to visit several exhibition spaces, where, in addition to some posters referring to the activities of the GAPIC,, there were several initiatives developed by entities such as the AIMS,, Ata Médica Student, Biobanco| iMM, FMUL, Library and Information Area, Clinical Investigation Centre of the CAML,, EIT Health, , the Institute for Advanced Training, and the Institute of Molecular Medicine. 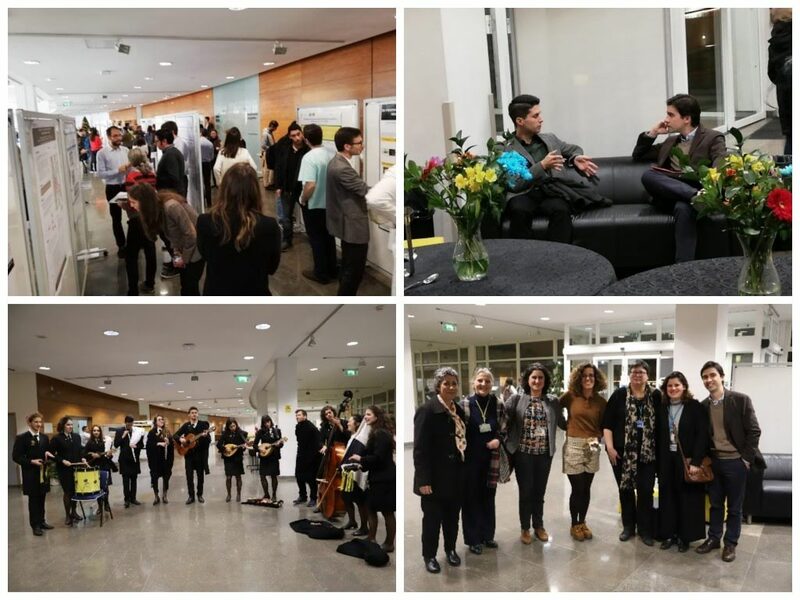 Research Day ended in celebration, with the participation of Tuna Médica de Lisboa, creating a moment of informal reunion of GAPIC, students, alumni and mentors to reinforce the bonds between the members of this community. Given the success of Research Day, it is already part of FMUL’s calendar. The GAPIC team invites you to this year’s edition, which will take place on December 11th, 2019. Save the date!